Tanzi completed her PhD research at ISF in 2011. Her thesis is titled "Connecting the social and ecological: an exploration of learning oriented, systemic practice in the field of environment and development". Her research was an exploration of the practical potential of ecological principles to guide the creation of socially and environmentally sustainable decision making within community development projects. 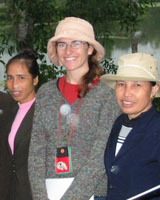 In 2005 Tanzi was awarded a Sir Edward Weary Dunlop Fellowship which helped to fund her PhD field work in 2006/2007 in Vietnam. Tanzi was also a Wentworth Scholar with the Wentworth Group of Concerned Scientists in 2010. Prior to joining ISF, Tanzi has worked in research, industry and consulting and also volunteered on a number of projects for Oxfam Community Aid Abroad in Melbourne. In addition to her recent 9 month stint in Hanoi, during 2002/2003 Tanzi also spent a year living and working in Ho Chi Minh City, Vietnam, as part of the Australian Youth Ambassador Program. Her education includes a Bachelor of Environmental Engineering (Hons I) and a Bachelor of Science from the University of Queensland which she completed in 1996 and 1997. She also holds a Graduate Diploma of Social Science (International Development) from RMIT and a Permaculture Design Certificate. Latest results in Education for Sustainable Development (ESD) research and practice show a tendency towards more holistic approaches aiming at deep transformation of the self and the meanings of human existence. Aligned with this, we present the Transdisciplinary Framework of Worldviews and Behaviours (TFWB) to describe the possible formation and expression of a worldview, a complex constellation of meaning and identity from which all human conduct emerges. Four key principles arising from the TFWB are: 1) The whole embodied nervous system is greater than the sum of its separated parts, especially when it comes to intelligence (information processing) and learning (meaning making); 2) The mind is a highly emotion-dependent and mostly unconscious entity; 3) A worldview is a unique arrangement of meaning each person builds, and lives through; and 4) Increasing self-awareness about how a personal worldview is formed and expressed generates increasing opportunities for that individual to explore and build a different meaning for their experience, or to explore and choose different forms to express it (behave). The TFWB informs a new perspective on learning that could be useful for the achievement of ESD's transformative goals, guiding the innovative design of educational initiatives encouraging new conceptualizations about the meanings of being human; thus, facilitating potential behavioural transformations toward a more sustainable existence. Research involving fieldwork can present the researcher with ethical dilemmas not anticipated in institutional ethics approval processes, and which offer profound personal and methodological challenges. The authors' experiences of conducting qualitative fieldwork in four distinctly different contexts are used to illustrate some of these unexpected consequences and ethical dilemmas. Issues encountered included: compromised relationships with informants which develop in unforeseen ways; engagement with traumatized informants which lead to unexpected roles for the researcher such as confidante, dealing with new information that is critical to informants' futures but could undermine the research project, and the implications of ethical decisions for research design and analysis. In our shared reflection on the four case studies in this paper, we examine anticipatory rather than reactive ways of dealing with such ethical dilemmas. Preparation and critical reflection are found to be key tools in relating to field informants, dealing with the personal challenges of undertaking field work, and developing useful research outcomes after returning home. We conclude by suggesting some issues for field researchers to consider in addition to the concerns addressed in a standard university ethics approval process. Throughout the development sector, there is increasing recognition of links between the environment and aspects of development such as poverty alleviation, health, income generation, and agriculture. While furnished with a diverse range of perspectives and approaches, development practice is in need of ways to better conceptualize the interactions between the social, environmental, and economic dimensions of sustainability so that opportunities for simultaneous improvement in human and ecological well-being can be identified more readily. Critical systems thinking is proposed as a way for development practitioners to conceptualize and act toward the integration of these economic, social, and environmental dimensions and, in so doing, support communities to nurture both human and ecosystem well-being. Four desirable attributes of a critical systems thinking approach to development are identified based on development literature, critical systems literature, and the authorï½s research into sustainability in semi-rural communities in Vietnam. The four attributes are `a systems thinking approach;ï½ `an ethical base to action and choices;ï½ `critical reflection permeates processes;ï½ and `appreciation of diverse views and application of diverse approaches.ï½ These attributes are described and then offered as the basis for further discussion of the ways in which simultaneous improvement of human well-being and ecosystem health can become an integral part of development practice. Transdisciplinary approaches to research and practice have widely been acknowledged as critical for tackling complex, messy and wicked sustainability problems that make a single disciplinary perspective of the problem inadequate (Hirsch-Hadorn et al. 2006; Lawrence 2010). In defi ning transdisciplinarity, the fundamental principles of such an approach to research and practice are to work in participatory ways and to tackle socially relevant issues with an overarching goal to transcend and integrate disciplinary paradigms (Pohl 2011). In this way a 'unity of knowledge', that goes beyond disciplines (Nicolescu 2002), is sought to improve the problem situation. Smith, T 2009, 'Using critical systems thinking to foster virtuous cycles of sustainability and liveability: A proposal for rural development practitioners', 53rd Annual Conference of the International Society for the Systems Sciences 2009: Making Liveable, Sustainable Systems Unremarkable, pp. 187-214. Smith, T., Edwards, D., Kazaglis, A. & Turner, A.J. 2007, 'How much further can demand management strategies go to ensure further water security for South East Queensland? ', Water...It's for life, Water...It's for life, AWA Regional Conference, Australian Water Association (AWA), Sunshine Coast, pp. 284-295. Mason, LM, Boyle, TM, Fyfe, J, Smith, T & Cordell, DJ Institute for Sustainable Futures, UTS 2011, National Food Waste Assessment, Sydney.